After retirement, I absolutely wanted to avoid the festivities that in my case I felt especially hypocrites. Printed on fine art paper, accompanied by a letter of which I bring the text. For so many summers I went to the bank wearing the flip-flops, perhaps the only male Italian bank to do it. Certainly not without difficulty and recalls, whether they are beyond physical pleasure, they have become a symbol of my “intellectual freedom” and ostentatiously taken away from conventions and formalisms that are not acceptable to me. 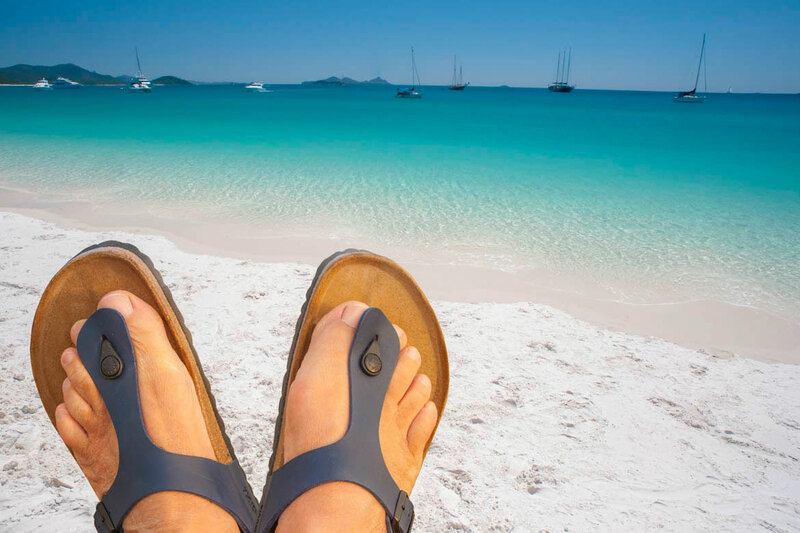 In the picture my feet against the backdrop of the spectacular and remote Whitehaven Beach, Whitsunday Islands, Australia. In the distant first of March 79 the streets were whitewashed, but it was not the slight night snowfall from one day to another of banking work. I who usually are a punctual should have been able to grasp immediately and interpret the unequivocal signs of fate. A gap, that half hour, which in all these years I have never been able to fill. It went like this with the bank, a job and an environment in which I do not identify myself, but that I tried to honor with a responsible commitment and in certain periods, also much appreciated and rewarding. I think I’ve always been better than I preached. The computer has deluded me for years and told me with a useful preparation in the professional sphere, as well as in the personal one. Then the dark years have arrived, but I never thought about how low we could arrive, even and above all from the human and ethical point of view. I think I have touched the bottom, crushed between huge interests and bleak opportunism made on power games, connivance and bribes. I faltered for a short time, but as a former sports agonist I found the resources to get back on my feet. Certain wounds leave deep and indelible scars, but they forge you into the fire and that fire continues to burn inside of me nourishing my insatiable desire to think, to the end, all my dreams of my daily life. The part-time was fundamental, obtained with great sacrifice and thanks to the help of those who understood how essential it was for me. Since then I am more serene, I found the time and the way to understand who I was and what I wanted to do when I grew up. I found a balance between necessity and utopia, pragmatism and intellectual freedom, daily life and creativity. The best way to share my world was found. A thought and a thank you to the many colleagues and collaborators are compared, in particular with the people they are painful, intolerance and satisfaction, fatigue and fun. With someone, a true, sincere and profound friendship was born. Thank you all, Merry Christmas and good … end!